Will the snozzberries taste like snozzberries the second time around? Broken Lizard announced Thursday that Super Troopers 2 will hit theaters nationwide on April 20, 2018. 4/20, meow! Super Troopers premiered at the 2001 Sundance Film Festival and went on to become a cult classic. More than 15 years later, the full five-man Broken Lizard crew is back for the sequel, which was funded in part by an Indiegogo campaign that launched in March 2015. It raised more that $2 million in its first day and wrapped in April 2015 having raised more than $4.6 million from more than 50,000 contributors. Super Troopers 2 Cast Interview: The Cannabist’s Jake Browne caught up with Broken Lizard stars Kevin Heffernan, Steve Lemme and Erik Stolhanske in April 2015 to talk about man-crushes, their favorite sequels and how they’ve grown to love doing promotions in their trooper uniforms. 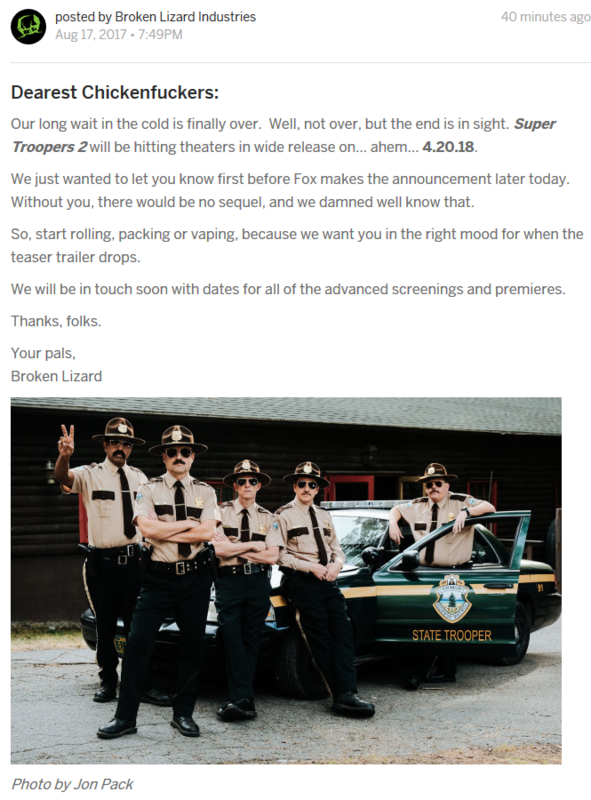 What are the odds the film will make a statement on the plight of marijuana legalization in the Super Troopers’ home state of Vermont? Earlier this year, Vermont Gov. Phil Scott vetoed legislation that would have legalized possession of marijuana for residents. After a compromise measure he negotiated was blocked by state House Republicans in June, Scott this month announced that he was organizing a commission to study issues related to legalization. While the new Super Troopers will apparently focus on a U.S.-Cananda border dispute, a real border brouhaha is brewing on the Green Mountain State’s southern border as Massachusetts prepares to legalize recreational marijuana in less than a year … maybe even by the time Super Troopers 2 hits theaters. Meow.